This letter was started on March 30 and the initial cut-off for signatures was to be April 3 for an April 4 submission. On April 2, Judge Brody ruled April 3 as the cut-off for responses to the Locks motion and in compliance, we cut off signatures on Monday, April 2, and overnighted the letter to her office. It was confirmed received by FedEx at 11:59 AM April 3. The letter has not been posted to the docket as requested. The undersigned Class Members wish to express our support of the motion of Class Counsel Locks Law Firm for Appointment of Administrative Class Counsel. 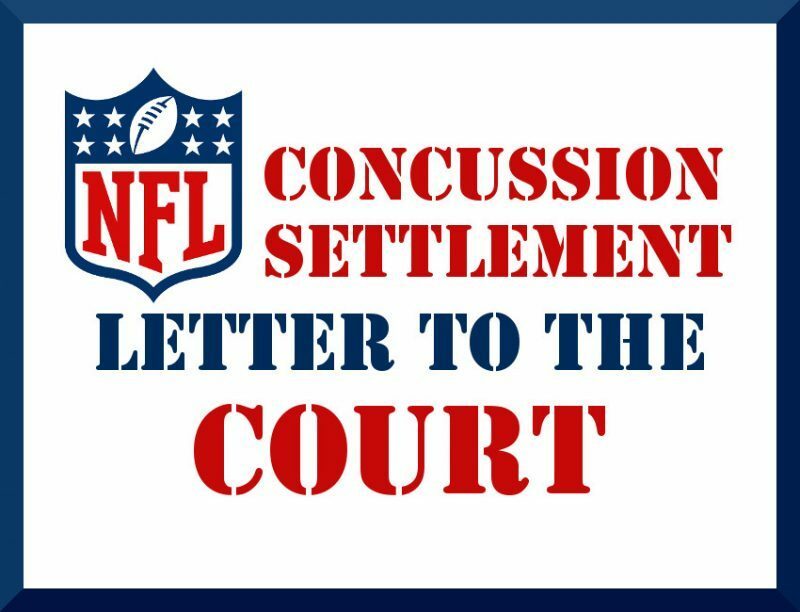 As the Settlement has reached the one-year mark of claims processing we have sadly learned that we were deceived by the NFL and our own Co-Lead Class Counsel, Chris Seeger. The Settlement has devolved into a “bait and switch” scheme in which players and their families were sold a completely different program than the one aggressively marketed to them. In a December 2012 New York Times article Chris Seeger is credited with the following statement, “[P]layers with diseases that have already been diagnosed should receive checks within weeks after filing their paperwork.” Throughout the registration process this mantra permeated the retired NFL Community. We were led to believe that if we submitted our medical records our claims would be processed in an honest, quick, and efficient manner. We were told that we didn’t even need a lawyer. We were never informed of new language that was added to the Amended Settlement which allows the NFL nearly unlimited power to audit, delay and deny claims. Instead of submitting our medical records and receiving prompt and fair claims processing, we have been subjected to a hellish process in which those of us fortunate enough to have had claims approved have waited months, and the majority of us are still waiting upward of one year. We have completely lost respect for and confidence in Co-Lead Class Counsel Chris Seeger regarding his ability and desire to keep his promises and deliver the settlement he convinced us to join. A motion was filed by X1-Law in August, seeking to call the Court’s attention to changes to the Settlement by way of interpretation. This motion was joined by several other firms, but instead of protecting the Class from an interpretive amendment to the Settlement without notice to the Class, Mr. Seeger, jointly with the NFL opposed this motion and convinced the Court to rule against it. Now Locks Law Firm points out the same issue and thirteen additional problems that we can attest to because we are living them. Zimmerman Reed’s joinder describes the many inefficiencies of the BAP program that are impacting us. These need to be corrected as well. As wives, we have seen our husbands obsess over the unfairness of the Settlement and as a result, we have seen their limited faculties diminished even further because of the stress. Those of us without wives or family to support us are struggling and losing hope. We believe that many of the Settlement’s failures rest on the fact that Mr. Seeger personally represents very few clients in the Settlement, instead depending on the lion’s share of the common fund agreed to by the NFL as his means of compensation. This leaves him in a position to favor the opposition rather than the Class your court appointed him to represent. We have looked at other MDLs in which Class Members, did not receive what was promised, two of which are Vioxx and Propulsid I; Mr. Seeger was a key figure in both. In the latter, denials by a panel of doctors who were shrouded in secrecy, much as the AAP, resulted in only thirty-two of 4,245 claims approved. Now that Mr. Seeger has been appointed Co-Lead Class Counsel to the Proton Pump and Syngenta litigation (where BrownGreer will be partnering as Claims Administrator in the latter) we have concerns as to if he will even prioritize this Settlement, especially in view of his unilateral request for an additional five percent of our awards, should the Court decline to accommodate him. The members of this Class are living their own personal nightmares every single day. The impact these diseases have inflicted on Retired Players and their loved ones is profound. The effect of the claims delays is unconscionable. We are not mere pieces of paper to be shuffled around or put in a queue until someone gets around to acknowledging us, but instead suffering human beings desperate for help. During the burdensome waits some of us have lost our homes. Others stand to lose them if a corrective course isn’t taken immediately. Some of our own doctors have grown unresponsive to us because of the NFL’s attacks on their diagnoses, and fear of being ostracized as Dr. Bennet Omalu was when he made the connection between football and CTE. We fear the vexatious, frivolous and bad faith appeals brought by the NFL with no cost nor consequence to them whereas we must come up with $1,000 if we are to appeal unreasonable denials. Many of us have poor credit because we have been unable to work and will not have the resources to defend ourselves. We deserve better. We deserve Class Counsel who keeps his promises and looks out for our interest. We are aware of the NFL’s reactive strategies to avoid bad PR and feel that the handful of dementia claims that were recently approved is part of this strategy to deflect bad press. While we are glad the claims were approved, the timing is suspect. Mr. Seeger’s press releases and public statements sound like those of a public relations strategist for the NFL and appear targeted to silence media stories on the implementation problems of the Settlement, especially regarding the low approval rate for dementia claims. Mr. Locks, in his motion. not only identifies the many problems that we are facing but also proposes solutions. He, and those who have joined his motion represent numerous Class Members and understand our challenges. We feel that given the opportunity, they will return the Settlement to the one promised to us, and for these reasons, we respectfully request that the Locks Law Firm motion for administrative counsel and a hearing on the problems we are facing be granted and that our letter in support be added to the docket via ECF.